Starting today, AT&T subscribers wearing the Samsung Gear S2 smartwatch can receive calls on their timepiece that were intended for their phone. Thanks to the carrier's NumberSync feature, which will be available on the Gear S2 following a software update, you will be able to receive messages on your watch that were sent to your handset. 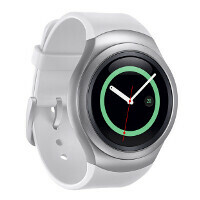 With NumberSync, you can also use the Samsung Gear S2 to send texts or make calls from your wrist. AT&T is selling the Tizen powered wearable for $99.99 with a two-year agreement. Those purchasing the smartwatch from AT&T starting today, will find NumberSync already installed on the device. A Mobile Share Value plan is required. New Plans start at $30 a month, while the watch can be added to an existing plan for as little as $10 a month. With NumberSync, you don't have to be anywhere near your smartphone to make or take calls using the phone number assigned to the handset. In fact, even if your phone is turned off, you can still make/take calls and texts on your NumberSync supported device. As for the Gear S2, we just called the the timepiece the best smartwatch of 2015, beating out the Apple Watch. Beating the apple watch? PA finally giving credit where credit is due. Yes finally! The Gear S is better too. The Moto 360 is better too in many ways. I need number synch to come to Rogers. My oneplus x and my lumia 640 has no sim in it. And my Nexus 6p has a prepaid sim in it. If this comes to Rogers I'll have like 5 phones. One for each day of the weekday and they will all be better than my work iPhone 6s dollar food dollars! Get on Rogers! I hope T-mobile does this too. Paying for extra numbers is stupid. I just ordered 2 from T for me and the wife to go with our Notes. Time to cancel the plan with vzw with my Gear S. I ain't wait. The wife will be surprised.